If you’re anything like me, you ooh and aah in stores like Anthropologie, but you turn into the “smiling-with-a-drip-of-sweat emoji” once you check the price tag. I love to take inspiration from some of my favorite stores and see what I can DIY; it’s a fun, creative challenge with lasting benefits. 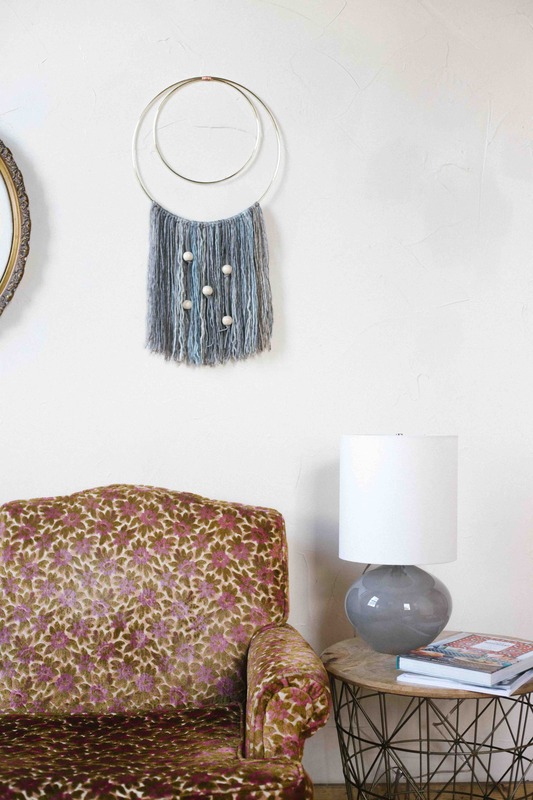 Here’s what I came up with after checking out Anthropologie’s assortment of fringed wall art. The one I made was super simple to assemble and you can complete it in just about an hour. Order some supplies, call up your friends, get a movie and you’ve got yourself a craft night! 1. Begin by cutting strips of yarn to the same length. To do this quickly, hold the beginning piece of yarn and then wrap it around your elbow 80 times. 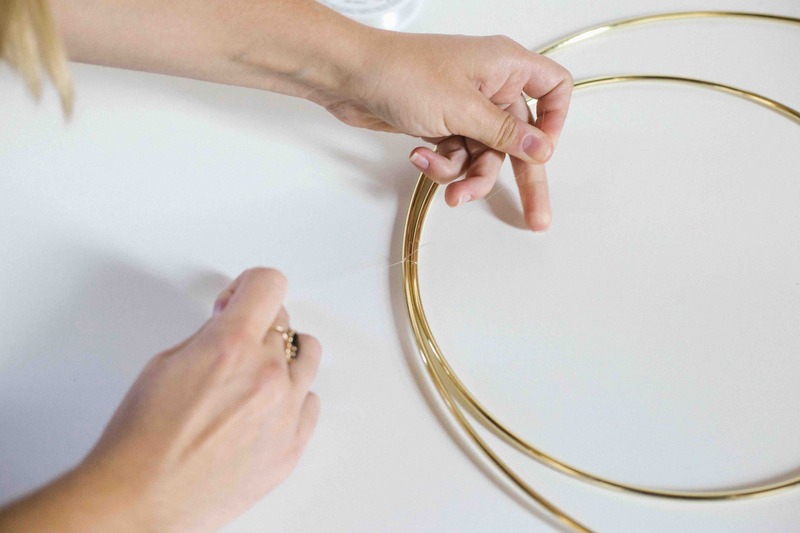 Once you have all the yarn you need wrapped in this circle, pull it off your elbow and cut through what you were holding between your fingers. *Note: If you miscount and don’t cut enough yarn, don’t worry! You can always cut more using your very official, elbow measuring tool. 2. To add the yarn to the 14 inch, gold ring, gather two pieces of yarn per tassel. Lay the ring down on a flat surface, and make an upside down “U” shape with the yarn by folding it in half. 3. 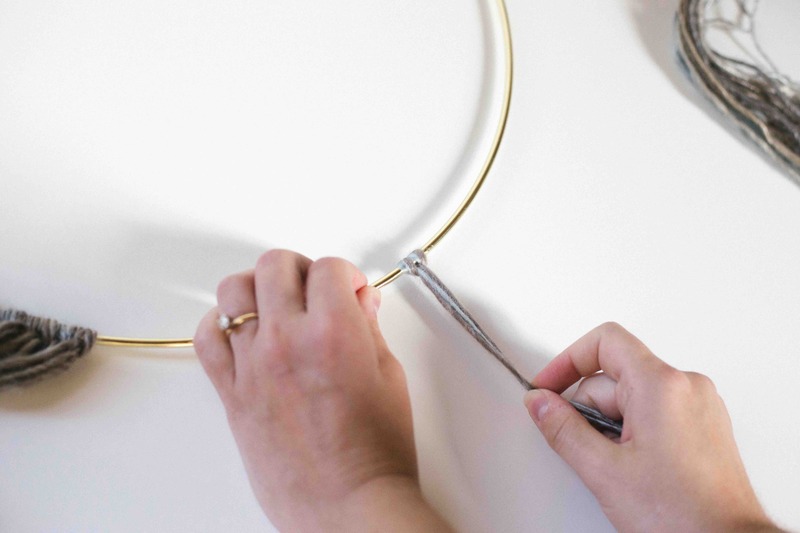 Place this underneath the hoop, then bring both the top loop and the two loose ends up. Thread the loose ends through the top loop and pull tight to secure the knot. Repeat this step 14 times (15 total) before moving on to the next step. 4. To add the leather, cut it to the same length as the yarn. You can either wrap this around your elbow or hold it next to a cut piece of yarn to match the size. 5. Fold the leather in half and make an upside down “U” like you did with the yarn. 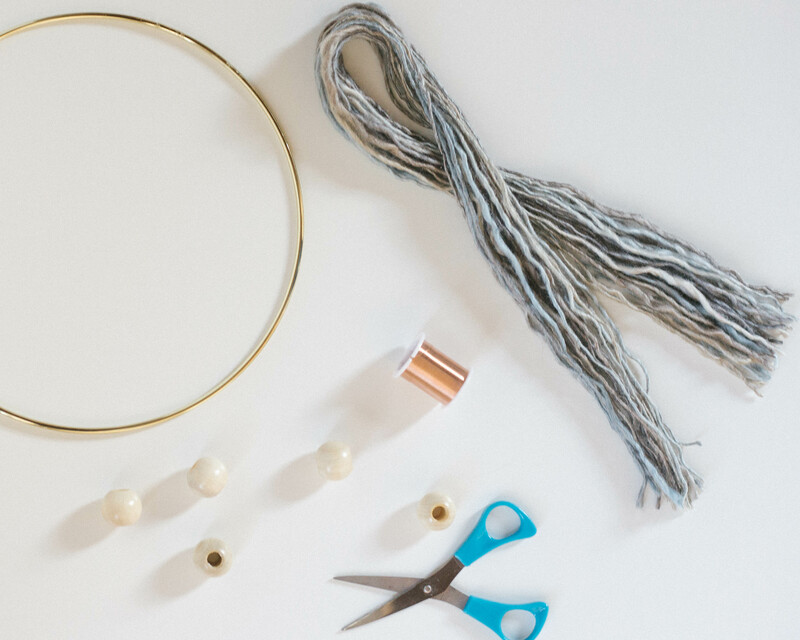 Like before, bring the loose ends around the gold hoop and through the top of the leather to create the same knot as you did with the yarn. Add beads to the leather by stringing the bead on the loose ends and tying a regular knot just below where you want the bead to sit. 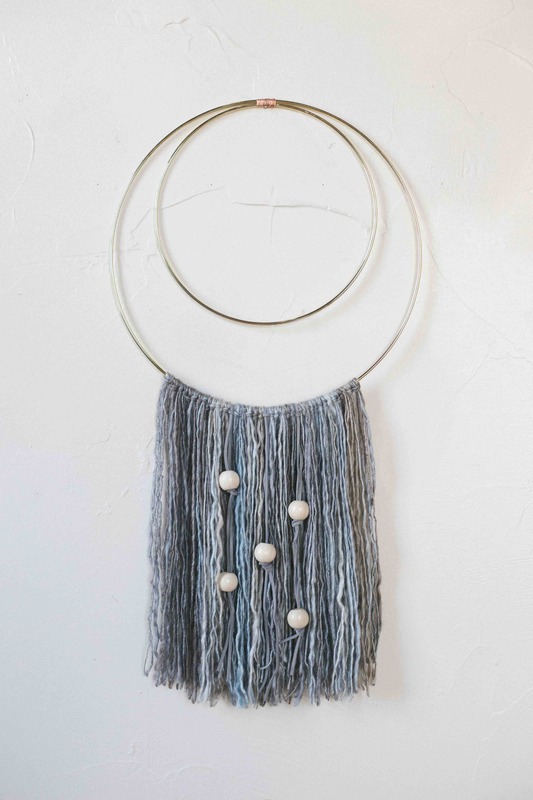 Repeat these steps to add more yarn and leather with hanging beads. In between the leather areas, I repeated the yarn step 5 times—so I used 10 pieces of yarn (since each yarn step calls for two pieces each time). The final count was 15 yarn steps (30 pieces of yarn), 1 leather step, 5 yarn steps (10 pieces of yarn), 1 leather step, 5 yarn steps (10 pieces of yarn), 1 leather step and finally, 15 yarn steps (30 pieces of yarn). If it sounds complicated, I promise it’s not! 6. To attach the two gold hoops, I came up with a little trick: Tie them together with fishing wire first, so the bond is stronger. Then, use the copper wire to wrap around the fishing wire. 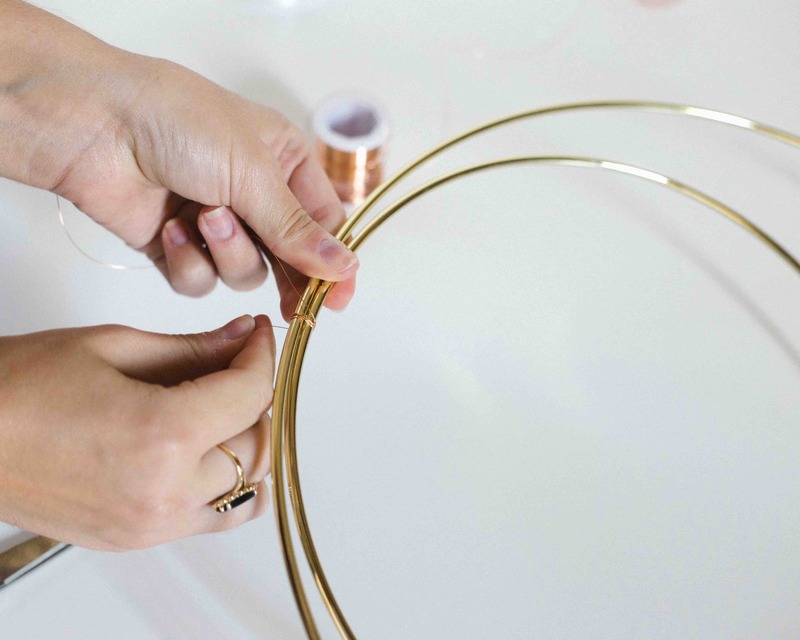 You can wrap as much or as little copper as you choose, since it’s not the only thing holding the two hoops together. 7. Once you’re finished, place the hanging art on a small nail. 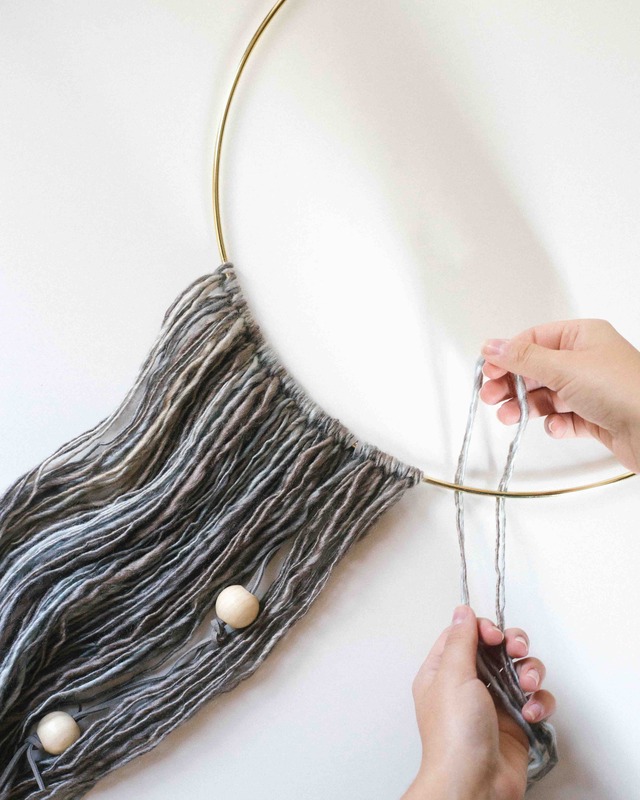 Trim the yarn and leather pieces at the bottom of the hanging to make sure it’s nice and tidy! 8. Stand back and admire your (affordable!) wall art.